The idea for this braided wire cuff formed while I was making Facing the Cobra II the other day. If you are wondering, the wires really met halfway. 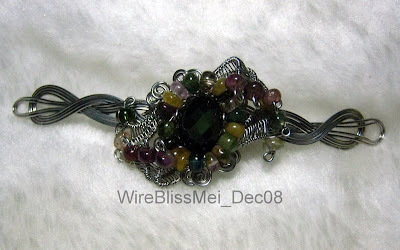 I used 22ga and 28ga wires and stones are all tourmaline of different color shades except for the focal which is faceted Obsidian. i really would love to see a tutorial on this. it's just amazing! Opal, I will add this into my "to do list" of 2009. Hello Mei, Best wishes in 2009, I really love this bracelet, the cobra cuff too and the sea horse pendant is awesome, please make a tutorial for the three!!! they are awesome, you make only good things!!! 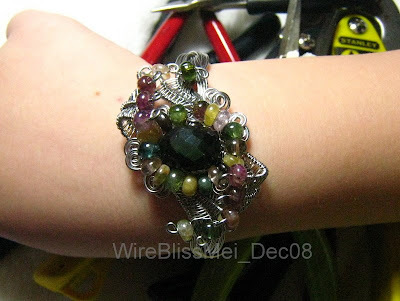 Oh Mei, I wish that you make tutorials for these 2 bracelet and for sea horse, please, I have not senn prettier, please, I will buy the tutorials, make it soon, I know, too much work, but I admire you and your work, you make so pretty things and I see always your work!!! you are a very good artist!!! Hi Teri! you are welcome. Still thinking of how to create the tutorial the best way as its a bit tricky on the "meeting" part.